Colorado River Guides has had the luxury of calling Steamboat Springs and the Yampa Valley home for almost 30 years. 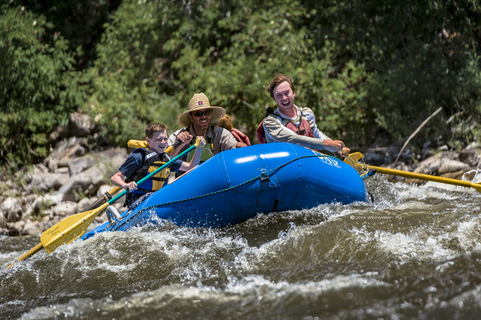 We have raised our family on the rivers surrounding Steamboat, and would love the opportunity to share these beautiful rivers, steep canyons, and rushing rapids with your family too. Our certified, experienced river guides will work hard to ensure you and your family have an amazing trip. Our Colorado River rafting trips, departing daily, meet on the river about an hour South of Steamboat. They are the perfect raft trip for the entire family. Kids and adults alike love our splashy interactive duckies, while those looking for a more relaxed and scenic float will enjoy our guided rafts. The Eagle River (flow dependent) is fantastic for those looking for more excitement and adrenaline. The Eagle River’s snow-fed waters rush down from some of the most famous ski resorts in the world right through the heart of the Rocky Mountains. Our Eagle River trips offer daily departures (May-June) meeting on the river about 1 hour and 45 minutes South of Steamboat Springs. Give us a call and create an unforgettable white-water rafting trip! Don’t forget about our famous Saddles & Paddles trip. These trips combine horseback riding, rafting on the Colorado River, and lunch in one day! Pack your boots & bathing suit and saddle up for an unforgettable full day of incredible mountain vistas on horseback, a homestyle picnic lunch, and an afternoon of splashy fun on a float trip on the Colorado River. We love seeing the river from the back of a horse and the back of a boat all in one day! So we decided to share our love for Saddles & Paddles with our guests. Our Saddles and Paddles trip meet on the Colorado river, about an hour South of Steamboat Springs. Please give us a call for more details. Advanced reservations for our Saddles & Paddles trips are encouraged as they tend to book up! Our family at Colorado River Guides takes pride in preserving the river’s natural ecology, as well as ensuring our guest’s safety on all trips. We are happy to help plan and reserve custom group trips for you family and friends. We are a small company, so advanced reservations are encouraged. 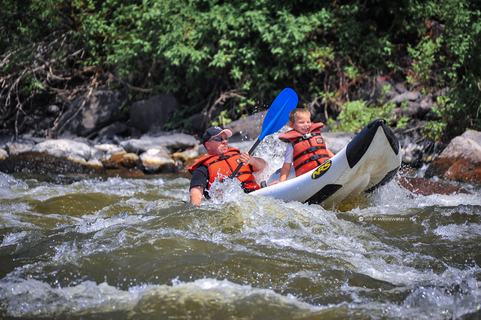 Call us today and let our family take your family on an unforgettable rafting experience! Awesome Family White Water Rafting Experience! "Everything was great! Chelsea, our guide was very informative & laid back. Our 8 year old daughter & 5 year old son took turns riding along with dad in a "duckie" while I relaxed in the large raft & enjoyed the beautiful views!! Great price, excellent service! Will definitely book with Colorado River Guides when we vacation in Steamboat Springs again!" "We were staying in Steamboat and wanted to avoid going back via Kremmling. Looked up rafting companies in the area and phoned a few. Brenda returned my call and was happy to have Paul take us on a trip the next morning. Driving down hwy 131 was scenic! It was a beautiful Colorado day on the beautiful Colorado River. Our wildlife sightings: 3 different bald Eagles, a muskrat, and a mink near the water. It was a safe trip to take our 2 Kids(both 7). Our kids really enjoyed having Lucy (Paul & Brenda's dog) along for the ride and enjoyed playing fetch with her. Thank you for a wonderful trip!" "This is our second year to raft with Colorado River Guides, and just as much fun as the first. As a family of four, we chose to take two ducky boats (inflatable two person kayaks) with an adult and kid (9 and 12 year old boys) in each one. We loved being close to the water, getting wet on the rapids, but still having the guides right there to make sure we were taking the best path through the water. Great guides, emailed directions made it easy to get there, a nd the super mascot, Xena the amazing Golden Retriever! We would strongly recommend them for a family raft!" "I've white water rafted several rivers and had actually done the Eagle a few years ago. But the water today was Absolutely Awesome! Our guide was Paul. He is one of the best guides I've ever been with. He made all of us feel comfortable! I didn't think I would ever be able to make another white water trip but Paul made my dreams come true today. We took our 14 year old grandson on his first adventure and he loved it. Paul put my husband, grandson, and myself right at ease. He taught us the history, and geology, of the river all along the way. The rapids are perfect right now. Plenty of excitement for young or old. Thanks Paul for making my dream come true. Would recommend this for anyone wanting to try whitewater rafting." Enjoy a beautiful 55 mile drive through Steamboat’s scenic South valley, known as the Gateway to the Flat-top Mountains. Take a first hand look at Colorado's history by passing through gorgeous glacially carved plateaus, towering volcanic monolith's, and quaint western towns which shaped the Yampa Valley's ranching community and Wild-West spirit; before descending into the red rock canyons carved by the mighty Colorado River.